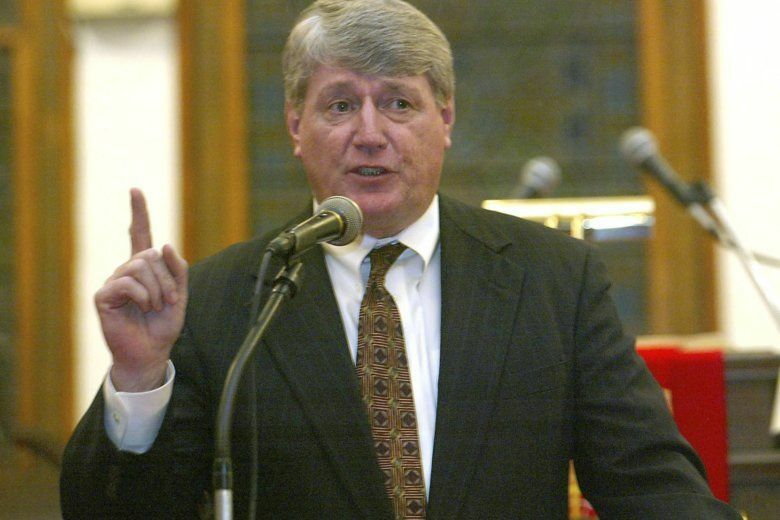 Maryland's deputy state archivist says late speaker Michael Busch had a close connection to the building where he served as a delegate for 32 years and as speaker for 16 years — and where he will lie in state next week. Maryland’s longest-serving House speaker, the late Michael Busch, will lie in state Monday inside what is the nation’s oldest statehouse in continuous use. It’s an appropriate setting for Busch, who was a history buff. Construction of Maryland’s State House began in 1772 and was completed seven years later. The annex that’s in use today was added starting in 1902. Elaine Rice Bachmann, Maryland’s deputy state archivist, said there have been three occasions when a public official has lain in state. Rice Bachmann — who also serves as the secretary of the State House Trust, which oversees the preservation of the State House — explained that Busch had a close connection to the building where he served as a delegate for 32 years and as speaker for 16 years. When visitors tour the State House, they can see the Old House of Delegates chamber — the creation of which was completed with Busch’s involvement. Rice Bachmann said it’s regrettable that Busch didn’t live to see the inclusion of statues of Harriett Tubman and Frederick Douglass, two towering figures in Maryland’s history. Those statues will be added to the State House next year, Rice Bachmann said. Busch had been a high school teacher, and during his political life, his interest and knowledge of state history grew. “He was a great reader. He really admired the great historians of the day, most specifically David McCullough,” Rice Bachmann said. According to her, Busch invited McCullough to address the National Speaker’s Conference in 2010 in the House of Delegates chamber. “I know it was one of his most proud moments,” she said. On the last day of the Maryland General Assembly session, the lawmaking stopped early, a half-hour before the normal midnight deadline. From 11:30 p.m. to midnight, a joint session of the House and Senate was held so lawmakers could share their memories of the speaker. Rice Bachmann was among those who had placed the black bunting that draped the speaker’s lectern earlier that day. “It was an honor to be a part of honoring him by laying that bunting. It will be an honor to be present in the State House while he is lying in state,” she said. While the mood on that day was somber all those in the State House, she said, “I think it was far harder for those who worked with him daily on his staff. Arrangements for the lying in state are also being overseen by Gov. Larry Hogan’s office. Public visitation will be 1–7 p.m. on Monday and 8–10 a.m. on Tuesday. The funeral service will take place at 11 a.m. Tuesday at St. John Neuman Church in Annapolis, and a reception honoring Busch will be held 1–4:30 p.m. at the Navy-Marine Corps Memorial Stadium.